Hamas leader urges Gazans to keep up their protests on the Israeli border. 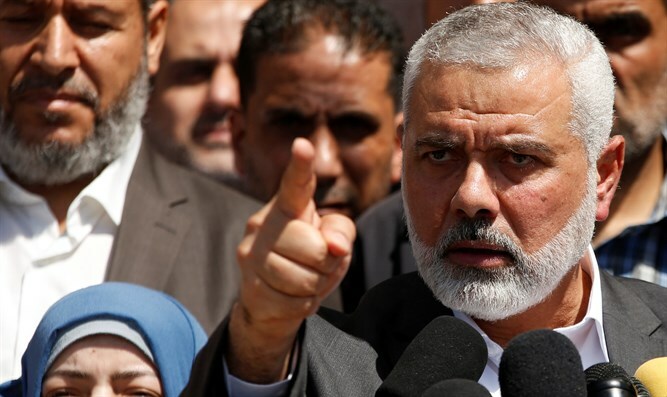 Hamas leader Ismail Haniyeh on Monday called on Gazans to keep up their protests on the Israeli border that have resulted in deadly clashes. "Gaza enters a new stage of peaceful and popular resistance," Haniyeh said during a visit to a tent camp for protesters, according to AFP. Tensions along the Israel-Gaza border have worsened in recent weeks, following the beginning of six weeks of violent demonstrations and attempted infiltrations into Israel along the Gaza security fence. On March 30, rioters kicked off the “March of the Return” demonstrations, which drew tens of thousands in clashes with IDF forces along the border. According to Gaza health officials, 29 rioters have been killed during the clashes with the IDF, with close to 3,000 more wounded. The IDF has reported that at least 12 of the rioters killed in the disturbances are terrorists with known ties to the Hamas organization, while others approached the security fence and attempted to cross into Israel, despite warnings by the IDF prior to the riots. On Sunday, the organizers of the riots announced that another “popular day of rage” will be held this Friday which will be marked by the burning of the Israeli flag and the raising of Palestinian Arab flags. The statement further stated that the processions will continue for many months, and that the confrontation with the "occupation" will continue and escalate until the "Palestinian people" realize its goals. Meanwhile, senior Hamas leader Mahmoud al-Zahar on Sunday warned the IDF against operating in Gaza in response to the “March of the Return”. "The message is clear, an eye for an eye. If [Israel] attacks inside Gaza, we will attack the settlements that are deep inside Israel," he threatened.